In sculptor and printmaker Liz Shepherd’s work, ordinary objects evoke the precious, exposed, and transcendent in life. A dresser cut in half hints at secrets and trauma. Ladders, shifting in scale and material, are magic carpets lifting us from what weighs us down. Her new exhibition “The Wait,” now at Boston Sculptors Gallery, revisits Shepherd’s vigil at the bedside of her dying father. In the mystical central installation, several papier-maché chairs hover in a circle well above the floor. 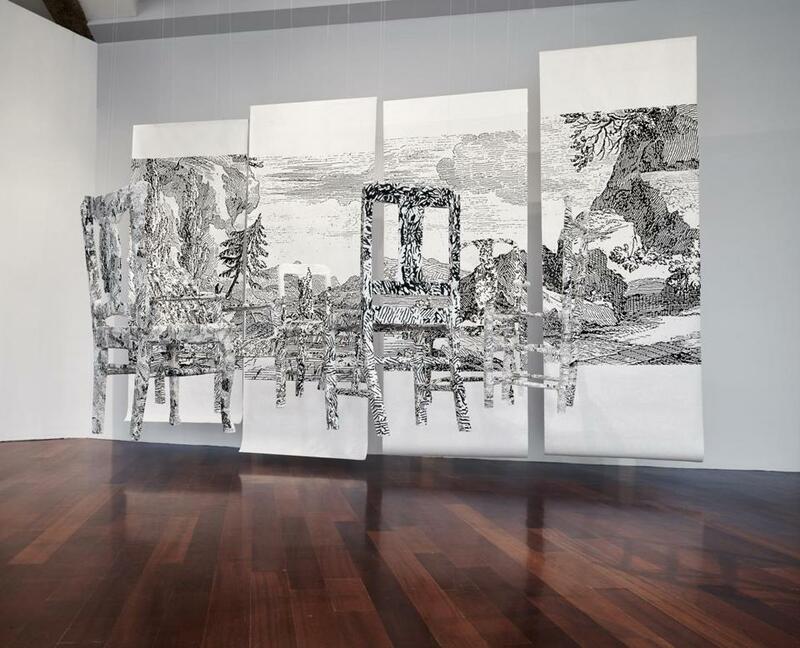 A screen-printed black-and-white landscape mural hangs behind them. Borrowed from Denis Diderot’s 18th-century encyclopedia, the expansive yet colorless landscape touches off yearning. Its inky black squiggles reappear on the white chairs, linking the two in a netherworld. The chairs are too lightweight to sit in. Some don’t even have seats. Still, their forms speak to abiding; their number speaks to communion; their emptiness speaks to loss. Their placement in midair suggests existence beyond the flesh, yet they inevitably refer to the body. Vigils with the dying can be penetratingly immediate, no matter their length. Anticipation of loss, confrontation with mortality, and the desire to ease the passage make these times sacred. The absence that follows penetrates again, then becomes a deep, familiar ache. This piece condenses the before and after, honoring the vigil and vibrating with the loss. 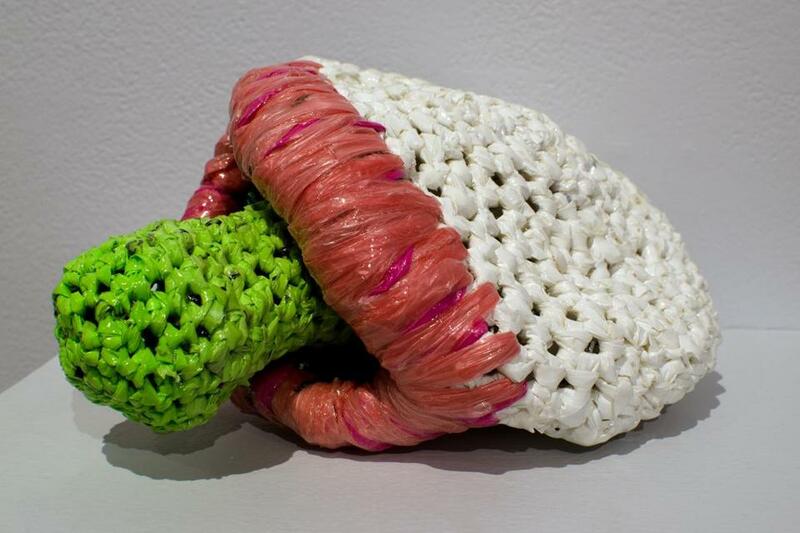 Michelle Lougee crochets plastic bags into pointed, insinuating, enchantingly goofy biomorphic forms, also on view at Boston Sculptors. The medium is her message: Plastic is poisoning the planet. But she’s no scold. Her sculptures alarm with their sheer amount of knotted plastic, but there’s hope. The largest work, “Larvae,” features a dozen parts with bulbous bases and long, wormy, red-tipped necks, squirming and craning. It was sparked by promising news of a caterpillar, called a waxworm, that eats plastic. Lougee plays with punchy color and provocative form. “Ovum” is vaguely salacious: A white egg with plump pink lips embracing a lime-green sperm. Plastic beguiles, too. That’s one reason it’s so insidious.